Ibb & Obb is the latest in stylish indie puzzle platformers that demands two people at the sticks. I say demand because if you try playing this alone, you'll quickly be turned off to what's an otherwise solid title. 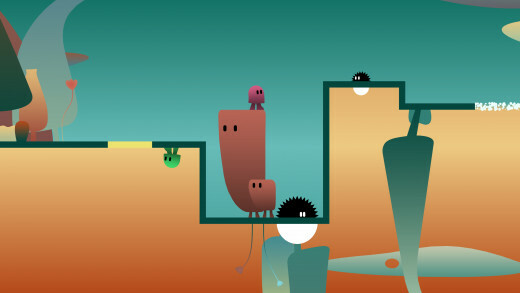 Ibb & Obb was designed for nothing less than cooperative play. 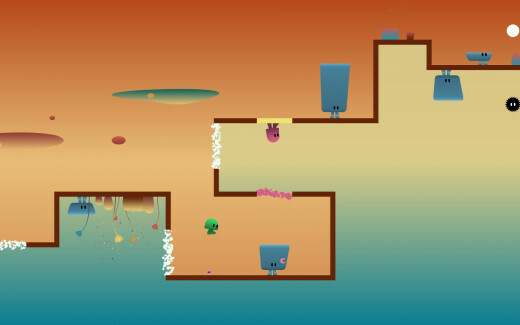 Players step into the adorable boots of blobs Ibb and Obb. 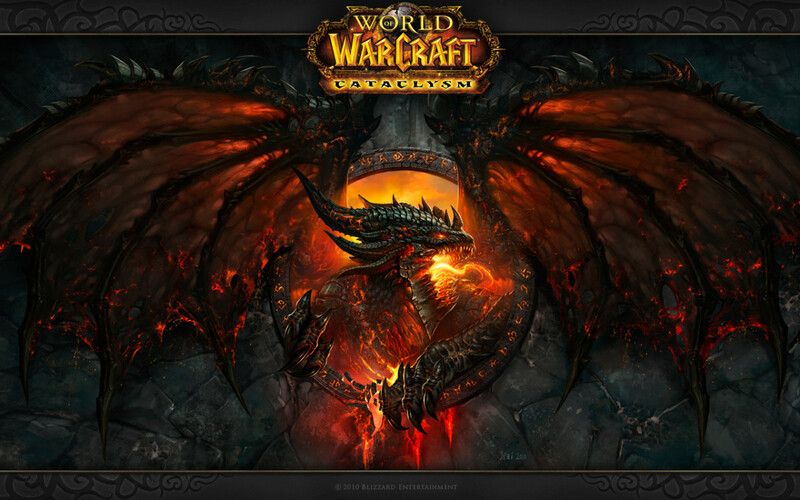 Vibrant levels are divided horizontally with each side accessible via white portals. 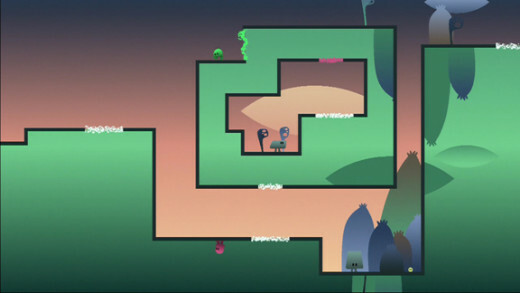 Players can travel either route together, but many obstacles require a player on each side so splitting up is practically required. For example, enemies are invulnerable on one side but have destructible weak points on the other. 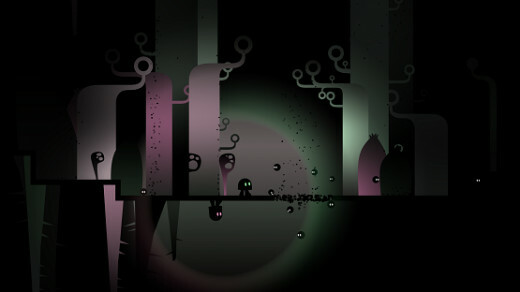 Momentum plays a large role in both platforming and puzzle-solving. Falling through portals from great heights sends you flying either higher (or lower) through the other side in the vein of Portal. Jumping onto bounce pads propels the player standing opposite of them. Some portals are color-coded to a respective blob, barring entry to the opposite half. Giant bubbles allow players to hover and propel themselves momentarily. Puzzles utilize one or all of these mechanics and stipulations to create well-designed conundrums that challenge players to find a way to get both players past an obstacle. When the game isn't testing your mind it puts your reflexes to the test. Many segments can only be completed by dodging or killing enemies that either bounce in a certain pattern, are gigantic, or both. Flawless timing between both parties, such as bouncing off each others heads to get over a large foe, is necessary for passing these areas and that's only attainable through practice and numerous deaths. Instant respawn alleviates frustration, but the more trying areas call for near monk-like patience and can really get stressful if your partner lacks the lightning-quick reflexes you may possess. Ibb & Obb reveals it's entire hand within the first hour. Every mechanic is introduced very quickly with few twists added as you go. One noteworthy level is shrouded in darkness, with Ibb and Obb acting as the sole light sources; staying together creates larger, brighter glow. Puzzles take on more complicated forms, but they all require the same thought processes you've mastered since the beginning. That's not to say the puzzles aren't enjoyable to solve, because, for the most part, they are. Early puzzles are quite simple but the difficulty skyrockets early on and may catch players still grasping the core concepts off guard. This game is absolutely meant to be played cooperatively. Not only is it easier to coordinate solutions with a second person but bouncing ideas off one another is inherently fun and a necessity for the more complex problems. 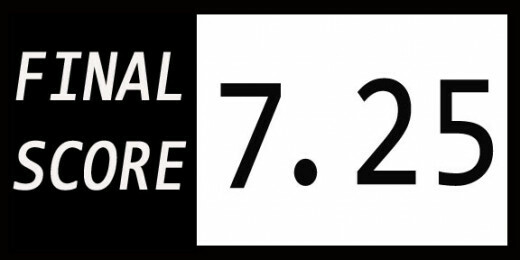 Single-player puts control of both blobs in one hand. Each is assigned to an analog stick and controlling both simultaneously is like patting your head while rubbing your stomach. Wrapping your head around that plus the inverted platforming makes puzzle-solving unbearable to the point that you shouldn't even think of playing this unless you have a buddy lined up to tackles it with. If you and your friend have blown through every co-op game out there and are looking for the next challenge, Ibb & Obb may be worth a look.